Nothing completes flawless foundation applications like a little touch of color. Adding a healthy, radiant glow to the skin, blush is a must for creating a look that’s ready to take on the world. 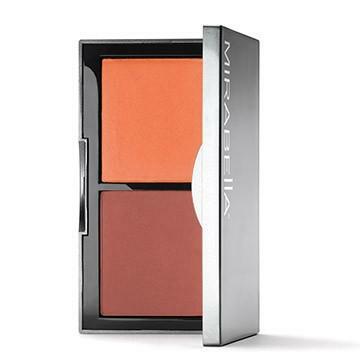 Mirabella’s Blush!Colour Duo creates a two-toned finish with its darker shade to accentuate and define cheek bones and highlighter to bring it all together. These perfectly paired matte shades are especially selected to work in unison to craft finished looks that are simply stunning. As with all Mirabella products, Blush! Colour Duo is formulated with quality and skin health in mind. This lightweight, mineral formula brushes on easy and is talc, paraben and oil free to create a light finish of perfection. Available in 14 shades, this formulation is ideal for women of all color. For looks perfected, try Blush! Colour Duo with Mirabella’s other products for the face. We recommend: Skin Tint Crème – This lightweight mineral-based foundation, glides on with ease. Its water-gel formulation dries quickly, leaving behind a silky, luminescent finish that serves as the perfect canvas for Blush! Colour Duo. Skin Tint Cream to Powder – This beautiful mineral foundation comes in compact form and brushes on smoothly. Providing light, translucent coverage, it transforms from a moisturizing cream into a powder, silky finish. While foundation provides the base for flawless looks, a little color is required to add that healthy glow. Be sure to explore the entire Mirabella line for other products to add color and shine to a finished look.